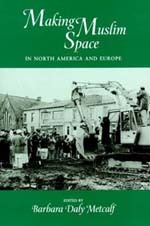 Focusing on the private and public use of space, this volume explores the religious life of the new Muslim communities in North America and Europe. Unlike most studies of immigrant groups, these essays concentrate on cultural practices and expressions of everyday life rather than on the political issues that dominate today's headlines. The authors emphasize the cultural strength and creativity of communities that draw upon Islamic symbols and practices to define "Muslim space" against the background of a non-Muslim environment. The range of perspectives is broad, encompassing middle-class professionals, mosque congregations, factory workers in France and the north of England, itinerant African traders, and prison inmates in New York. The truism that "Islam is a religion of the word" takes on concrete meaning as these disparate communities find ways to elaborate word-centered ritual and to have the visual and aural presence of sacred words in the spaces they inhabit. The volume includes 46 black-and-white photographs that illustrate Muslim populations in Edmonton, Philadelphia, the Green Haven Correction Facility, Manhattan, Marseilles, Berlin, and London, among other places. The focus on space directs attention to the new kinds of boundaries and consciousness that exist not only for these Muslim populations, but for people from all backgrounds in today's ever more integrated world. Barbara Daly Metcalf is Dean, Division of Social Sciences, College of Letters and Science, and Professor of History at the University of California, Davis. She is the translator of Perfecting Women: Maulana Ashraf Ali Thanawi's Bihishti Zewar (California, 1990).